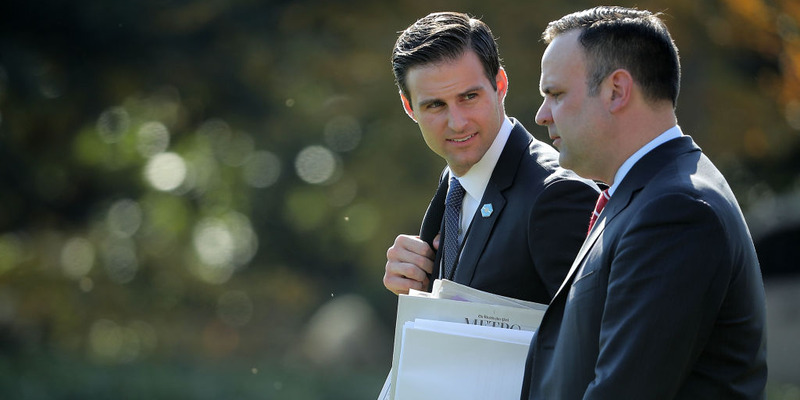 Photo by Chip Somodevilla/Getty ImagesJohn McEntee, President Donald Trump’s personal assistant, and Dan Scavino, the White House director of social media, in November. President Donald Trump fired his longtime personal assistant, John McEntee, on Monday. CNN cited a source as saying McEntee is the subject of a financial-crimes investigation by the Department of Homeland Security. McEntee was escorted from the White House on Monday, The Wall Street Journal reported. Trump’s reelection campaign hired McEntee soon after his firing. President Donald Trump’s longtime personal assistant, John McEntee, was fired from his White House position on Monday. McEntee was escorted out of the White House on Monday without being allowed to collect his belongings, including his jacket, The Journal reported, citing White House officials. McEntee joined the president’s small team three years ago during the earliest days of Trump’s presidential campaign. “It’s not going to be great for morale,” a White House official told The Journal about McEntee’s firing. Soon after, Trump’s 2020 reelection campaign released a statement announcing that McEntee would join its ranks as a “senior advisor for campaign operations” along with Katrina Pierson.